The 2018 45th Annual Daytime Emmy Awards took place on April in sunny Pasadena California at the Pasadena Civic Auditorium. Mario Lopez and Sheryl Underwood were the emcees. I went as part of the team of the Emmy-nominated Tainted Dreams, nominated for Best Digital Series. The cocktail reception started at 2pm in the hall attached to the auditorium, but the action at that time was at the Red Carpet. The Red Carpet was well-organized. Actors and Emmy-nominated people were able to choose to walk it or not, and they had to wait in line for their turn. I really only saw one or two able to skip the line. All the actors posed for pics on the Carpet. Fans, even without a tickets, were able to view the actors on the RC at the beginning of the carpet or while they were waiting on the line, but for the rest of the RC the view was blocked by all the media. Some of the stars ended up at the reception after doing their duty on the Red Carpet, but by then there was just water left. A little before 5, the announcements were made to get to the auditorium and the Red Carpet and reception area cleared out. I had the pleasure of sitting two rows from the stage to to the right, so when the actors were getting ready to present they walked right past me so I knew who to expect next. Since I was near the stage, I was surprised at the amount of work just to keep the seats filled. It was constant up and down. Those seat fillers were all very well-dressed and were not into small talk, even though I tried. The day before I had sat in on rehearsal. I got a kick out of what the stand-ins for the presenters and Emmy winners said to fill the time slot allotted, For instance, the stand-ins had to say speeches for the winners and would say things like, "I'd like to thank everyone in the world!". Guess you had to be there but it was pretty funny who they were thanking. While I was there I did see Suzanne Rogers, Martha Byrne, Liz Hubbard, Sid and Marty Croft and others. I left with a bottle of Emmy water. I would have sat through more of it but the room was too cold. The rehearsal and all the planning certainly paid off. The ceremony was well-done and kept my attention.. Earlier outside the Red Carpet I had the privelage of talking to NJ Burkett, who I recognized as being one of our most trustworthiest and well-known news reporters from ABC News in New York. I had the pleasure of speaking to him and found out that he was there because he is the First Vice Chairman of the National Academy of Television Arts and Sciences. He told me (and my Facebook Live listeners) to expect a high-caliber show. And it did not disappoint. The show started with a fun dance number with dancers dancing down the aisles. The speeches were just the right amount of time, the clips were interesting and the tribute to Doug and Susan Seaforth Hayes was tremendous. Of course I am a DAYS fan so I left very happy. At the end of the show, a large amount of gold confetti was strewn about which was a nice touch, but kind of slippery. The after party was in the building next to the auditorium The decor was stunning, lots of gold and white. The dessert table was stunning in its presentation. The food was also quite good, there was prime rib, different kinds of sliders, veggies, pastas and really good desserts. There were delicious cookies with the Emmy logo on them. The food was also plentiful. 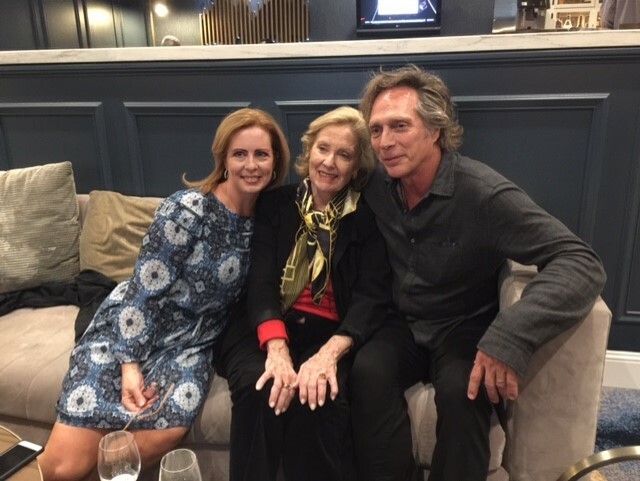 Because there were other parties for CBS and Days, most of the actors from those shows were not at the after party, but there were plenty of people from GH there, and many stayed until the wee end. I must say, even at the end they were still up to taking photos with their fans. If you are a fan of daytime, consider attending. Tickets were available to the general public, and the celebs are always up for meeting and greeting fans, so you'll get to meet many of the people you admire on TV and then get to watch a good show. Or, go online to become a seat-filler. There was also access to see the stars while they were doing the Red Carpet even without a ticket. The show was streaming online, but I think it deserves a place on TV. After all, the people watching daytime TV are watching traditional TV not predominantly online. 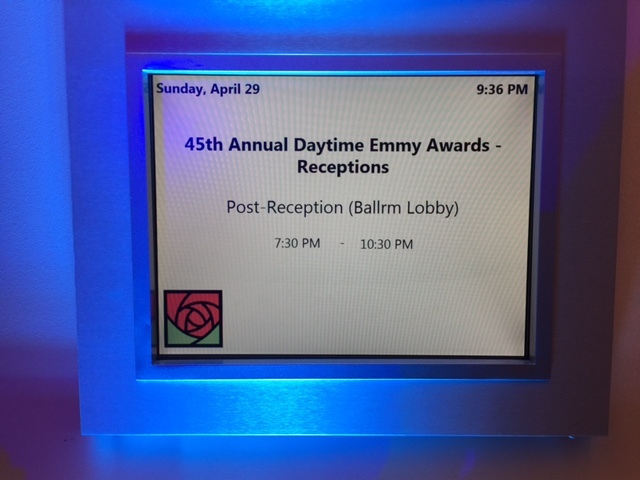 Later on that night, in the Sheraton attached to the center where many from out-of-town stay, I ran into the PR director for the Emmys, who was with Loretta Swit (a presenter). I had a conversation with him about this and not surprisingly, he agreed. It's so hard to get on broadcast TV like back in the day but I have hope that a cable station or top streaming network will realize the value of this awards show. What fan of daytime doesn't want to watch a parade of their favorite daytime actors waltzing down a Red Carpet in brilliant and stunning outfits, watching clips of some of the most memorable moments of the year from their favorite shows, rooting for with baited breathe and then seeing some of their faves win an Emmy? Here are my exclusive Red Carpet, Show, After Party and candid photos. See how many of the stars you recognize!